In the World Day of Peace Message for 2010 – “If you want to cultivate peace, protect creation” – Pope Benedict stated, “Man thus has a duty to exercise responsible stewardship over creation, to care for it and to cultivate it” . This simple statement captures a Catholic view of our responsibility towards the environment. It contains two key notions: care for the earth and cultivation of the goods of creation. Stewardship is a biblical notion and encapsulates a balanced approach to issues of the environment. Human beings have been entrusted with the earth but not to indiscriminately plunder it for immediate and, at times, selfish purposes. The dominion granted to man by the Creator is not an absolute power, nor can one speak of a freedom to ‘use and misuse’, or to dispose of things as one pleases. The limitations imposed from the beginning by the creator himself…shows clearly enough that, when it comes to the natural world, we are subject not only to biological laws but also to moral ones, which cannot be violated with impunity . Stewards, as caretakers for the things of God, are called to use wisely and distribute justly the goods of creation to meet the needs of all people. Stewardship of creation is a foundation for a Catholic environmental ethic. From this foundation the Church can then engage with scientists and philosophers and address the emerging questions on the environment. Our notion of stewardship comes from biblical creation theology, which is to be found throughout the Bible but is most evident in the Book of Genesis, the Psalms, and the Wisdom literature. Some basic principles emerge from the biblical teaching and theological reflection on these truths. These principles provide a sound foundation for Christian reflection in order to respond appropriately to environmental issues. The biblical revelation begins with a clear statement that the entire created order has its origins in the sovereign, creative and sustaining power of God. In other words, creation finds its meaning in God. The Catholic Catechism states, “God created the world according to his wisdom. It is not the product of any necessity whatever, nor of blind fate or chance” (CCC 295). Creation is not a singular event; it is an ongoing process requiring the continual sustaining power and presence of God. Biblical faith captures this in Psalm 104 which states that God “will give them their food in due time” (v.27). It is evident from simple observation that creation is ordered. God creates order out of primordial chaos (see Gen. 1:2). The Genesis account of creation speaks of a garden – depicted as the Garden of Eden (2:8). Given the harsh environment found in the Middle East this image expresses the idea of a congenial habitat for human beings. The biblical teaching also reminds us that creation is a harmonious whole in which all creatures fulfil their appointed places and functions. Creation is interrelational and God is the primary author of the meaning and value of creation. Finally the biblical teaching highlights that creation is a revelation of the nature of God – God’s power, goodness and beauty – and at the same time shows forth the human vocation in the world. It is necessary to make a distinction between the concepts of nature and creation. The concept of nature is not a biblical notion. Nature, derived from the Greek worldview, is a scientific concept and refers to a self-sustaining system replete with its own internal laws. Creation, on the other hand, is a biblical concept and recognizes that creation is not self-sustaining but has come from God and is continually sustained by God. The Christian faith teaches that God is transcendent to creation and, at the same time, is the active sustainer of creation. The concept of stewardship is based on the biblical teaching that God has entrusted his creation to human beings: “Be fruitful, multiply, fill the earth and conquer it” (Gen 1:28). Stewardship points to the purpose and role of humanity in creation. Psalm 8, a hymn of praise to God for the wonder of creation, declares: “O Lord our God, how majestic is your name throughout the world!” It describes the role of humanity in these words: “You made him ruler over the works of your hands; you put everything under his feet: all flocks and herds, and the beasts of the field, the birds of the air, and the fish of the sea, all that swim the paths of the seas”. The notion of steward is captured in the words, “You have made him ruler” (Ps 8:6). A steward is one who has been given the responsibility for the management and service of something belonging to another. In this case the earth belongs to God, and God has entrusted the earth to humanity. The Book of Leviticus reminds the Jewish people that the land is not theirs: “for the land belongs to me and you are only strangers and guests” (Lev 25:23). The command for the Sabbath-rest for the land – “in the seventh year, the land is to have a rest” (see Lev 25:4-7) – further reinforces the notion that the land is God’s and comes under the sovereignty of God’s good order of things. Thus, God’s wisdom is that there should be a prudent use of the natural resources entrusted to human beings. The account of creation given in the Book of Genesis speaks of human beings as being created in “the image and likeness” of God. They are given authority from the Creator to subdue the earth and have dominion over creation (see Genesis 1:26-28). Some comments are in order here. The use of the terms “image and likeness” proposes that human beings have been given the responsibility of representing God in the midst of God’s creation. They are to act on behalf of God, the Creator. The notion of “dominion” does not imply that humanity can exploit or destroy but rather it proposes that humanity exercise care and responsibility for God’s gift. In the Old Testament the role of the king was not just the naked use of power but was meant to enshrine concern for those who are poor and marginalized. The Old Testament carries the idea of the king being a shepherd to the people (see Ezek 34). A shepherd – as Jesus teaches – is one who cares for the sheep (see Jn 10). The king in Israel is meant to have a pastoral heart. Pope John Paul II taught, “The essential meaning of this “kingship” and “dominion” of man over the visible world, which the Creator himself gave man for his task, consists in the priority of ethics over technology, in the primacy of the person over things, and in the superiority of spirit over matter” . Thus, dominion implies a spirit of responsible stewardship of what has been entrusted. In Genesis 2:16 the biblical text says that human beings are to cultivate and care for the earth. The language here is clearly agricultural. It carries with it not just exploitation, but careful nurturing of the potential of the earth, particularly to ensure future harvests. History reveals that human beings have not shown the stewardship that is expected of them. The Book of Genesis explains this sad reality when it describes the original sin of Adam and Eve. As a result of this sin the original harmony between the natural world and humanity is irrevocably broken. The biblical teaching is strong: “Accursed be the soil because of you. With suffering shall you get your food from it” (Gen 3:17). The redemptive act of God in Christ has effected an atonement for human sin and a restoration of the relationship between God and humanity. The death of Christ on the cross has an effect on all of creation. St Paul comments that God “would bring everything together under Christ, as head, everything in the heavens and everything on earth” (Eph 1:10). The biblical notion of stewardship of creation, then, is the foundational framework for a Christian ethical response to the environmental challenges we now face. Stewardship proposes that human beings are entrusted with the earth to cultivate it and, at the same time, to care for it. Human beings are endowed with the capacities of intelligence and creativity which enable them to address issues of both the task of development and the oversight of sustainability. There are some fundamental principles through which human beings engage with the environment. The first principle is that human stewardship is conscious of the interrelatedness of human beings and the rest of creation. It respects the richness and diversity of all forms of life. It promotes the flourishing of both human and non-human forms of life. A second principle is that this stewardship of creation must recognise that humans are the apex of creation. Human beings alone have the capacity for conscious self-reflection. They alone are ethical beings. While belonging to the earth, humans also have a divine element – an immortal soul. This dignity of the human person is the basis for God’s entrustment of created reality to humanity’s responsible stewardship. We have a capacity to respond to the needs of creation. Creation is for humanity in a unique way, and it is given on trust. Stewardship will value creation in its own right independent of its instrumental value for fulfilling human needs. The Book of Genesis reminds us that “God saw everything that he had made, and indeed, it was very good” (Genesis 1:31). Humans thus will seek to preserve the evident good of creation. As moral beings we do not absolutise creation, but recognise human failure in environmental degradation and its possible source in social injustice and economic poverty. Thus, stewardship of creation must include developing norms for ethical behaviour, both individually and collectively. The Church can identify the moral imperatives and the corresponding biblical underpinnings, but moral principles must translate into practical action. What science can offer us – both in interpreting what is occurring in the environment and in what it can do to address problems – is tied to moral principles. In this regard, it is not enough to adopt a morally censorious attitude, without offering possible ways forward. Human beings have the capacity to deal with the issues as they arise. Humanity is endowed with intelligence and creativity. Individuals and societies can seek to develop economically within a framework of moral and juridical guidance. Advancements in the quality of human life are not necessarily threats to the environment. In fact, humanity must continue on the path of development for the sake of protecting the environment. Advances in science and knowledge of the natural environment seek to find technical solutions to environmental issues. True human stewardship will call for personal attitudes and public policy to engage the best technical skill, practical wisdom and utilise accumulated human experience. The democratic political systems and the wise use of market economies provide the best setting for sound development coupled with environmental protection. What must underline such approaches is the development of moral values. Pope Benedict made reference to this in his World Day of Peace Message when he said, “The goods of creation belong to humanity as a whole. Yet the current pace of environmental exploitation is seriously endangering the supply of certain natural resources not only for the present generation, but above all for generations yet to come. It is not hard to see that environmental degradation is often due to the lack of far-sighted official policies or to the pursuit of myopic economic interests, which then, tragically, become a serious threat to creation” . The Pope’s recommendation is not the abandonment of human technical and economic development but rather the utilisation of this development for the ultimate good of the environment. He says, “To combat this phenomenon, economic activity needs to consider the fact that every economic decision has a moral consequence and thus show increased respect for the environment. When making use of natural resources, we should be concerned for their protection and consider the cost entailed – environmentally and socially – as an essential part of the overall expenses incurred”. Thus, development must be accompanied by an increased environmental awareness. The Pope looks to governments and the international community as a whole to address these challenges, “To protect the environment, and to safeguard natural resources and the climate, there is a need to act in accordance with clearly-defined rules, also from the juridical and economic standpoint, while at the same time taking into due account the solidarity we owe to those living in the poorer areas of our world and to future generations”. It is not without interest to note that the words “ecology” and “economics” derive from the same root word “eco” – from the Greek, oikos. Oikos has to do with the household. In the word “economics” it refers to the actions of buying and selling, using goods and services to meet human (household) needs. The word “ecology” came to be used in the mid nineteenth century and refers to the science (logos) of the laws which effect the earth – the home (oikos) of life. Ecology and economics do not need to be seen as opposing forces. Rather they can be seen as two complementary entities – humanity seeks to both to improve the quality of human life and protect and preserve the earth’s beauty and resources. In the past – and it continues today – much environmental harm was done through unthinking economic development, especially during the early phases of the industrial revolution. We have come now to see these negative aspects more clearly, and many developed economies have put environmental protections in place. Rivers are cleaner, air is purer, and more trees have been planted. There is a growing consensus which recognises the value of a serious effort at responsible stewardship. Humanity still has some way to go, but developed economies, particularly, are moving in the right direction. We need the service of good and dispassionate environmental science. Pope John Paul II has stated, “Reverence for nature must be combined with scientific learning” . The debate on climate change and claims of global warming has suffered from the politicisation of science. More time is needed to ensure that social and economic policy is grounded in solid and not speculative science. Public debate on issues of the environment needs to be put within the broader context of other issues. No one issue can be made an absolute. There will be always competing demands. The overall economic good cannot be unnecessarily threatened by an extreme focus on environmental issues. For effective development of a sustainable future for humanity, the environmentalist and the economic developers need to come into a more serious and open dialogue. Pope John Paul II commented that “the free market is the most efficient instrument for utilising resources and effectively responding to needs”. Those committed to the environmental movement should see the possibility of an effective coalition with those shaping the economy. The basis of free market economies is private ownership. It is a truism that an owner takes greater care of his property than does one who is simply using the property. An owner is the best steward of his resources. Our experience in the recent past has shown that command economies and centralised planning are not necessarily successful in reducing pollution. Rather the path forward is through the encouragement of environmental stewardship in free institutions. Market forces – where there is a clear public consciousness of the needs of the environment, can actually work to increase environmental protection. This is why God entrusted the earth to human beings. However it does need to be said that societies where property rights are in the hands of a few, are often greater offenders on environmental issues. The greater distribution of the land resources among the people will ensure better environmental outcomes, as well as a better basis for economic development. It follows that working in a practical way to encourage and promote greater environment stewardship is capable of great outcomes. Simply imposing taxes on emissions is likely to only set up a lucrative system of trading (for some) while levels of pollution remain untouched. At this moment in history humanity faces real challenges in protecting and preserving the environment for future generations. God has provided humanity with the richness and beauty of the earth. We are conscious of the immense resource that nature is and the genius of humanity to face challenges and resolve them. Thus we look to the future not with fear and foreboding but with hope and confidence. In the Church’s experience heresy is understood as a truth taken to an extreme. A Catholic approach to environmental questions seeks to avoid the adoption of extreme positions with regard to the environment. It is conscious to avoid darkly pessimistic views of the possible future of humanity. Such positions offend against Christian hope. Pope Benedict in the World Peace Day Message (2010) spoke of the danger of what he called “ecocentrism and biocentricism” . As the Pope explains, “it is because such notions eliminate the difference of identity and worth between the human person and other living things”. Such approaches which attribute an equal value to all living things abolish, in the Pope’s words, “the distinctiveness and superior role of human beings”. Some lines of thought among Catholic commentators, drawing on an evolutionary paradigm fail to effectively distinguish between humanity and the rest of creation. The Pope continues, “They also open the way to a new pantheism tinged with neo-paganism, which would see the source of man’s salvation in nature alone, understood in purely naturalistic terms”. This warning from Pope Benedict is an important one for all Catholics involved in the environmental movement to heed. Pope Benedict urges a balanced approach, “The Church, for her part, is concerned that the question be approached in a balanced way, with respect for the ‘grammar’ which the Creator has inscribed in his handiwork by giving man the role of a steward and administrator with responsibility over creation, a role which man must certainly not abuse, but also one which he may not abdicate”. Nor must humanity adopt a selfish anthropocentricism where the needs of the environment are ignored and what is offered to future generations is jeopardised. Once again Pope Benedict is alive to the dangers that can exist: “In the same way, the opposite position, which would absolutise technology and human power, results in a grave assault not only on nature, but also on human dignity itself”. The biblical concept of stewardship offers the path for such a balanced approach, and can provide a theological foundation to environmental thought and practice. Pope Benedict XVI, Message for the Celebration of the World Day of Peace, If you want to cultivate peace, protect creation. (1 January 2010); cf. Pope Benedict XVI, Encyclical Letter, Caritas in Veritate, 50. This and the following quotes are from n.7 of the World Day of Peace Message 2010. United States Catholic Conference, Pastoral Statement, Renewing the Earth: An Invitation to Reflection and Action on Environment in Light of Catholic Social Teaching (November 14, 1991), IV, B. The references in the section that follows are taken from n.13 of the World Day of Peace Message, 2010. 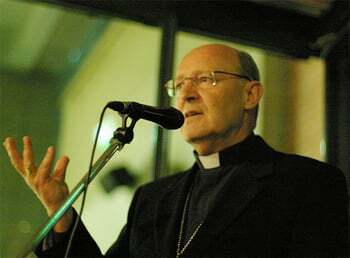 Archbishop Julian Porteous was ordained priest for Sydney in 1974, and is bishop of the Hobart diocese.